The bio-musical Million Dollar Quartet (MDQ) has become a seemingly unstoppable success on stage. And that makes sense – given that it’s based on an actual chance gathering and collaboration by unstoppable and incomparable musicians. MDQ is a story wrapped around a one-night jam session that brought together four future music legends: Elvis Presley, Johnny Cash, Jerry Lee Lewis and Carl Perkins. 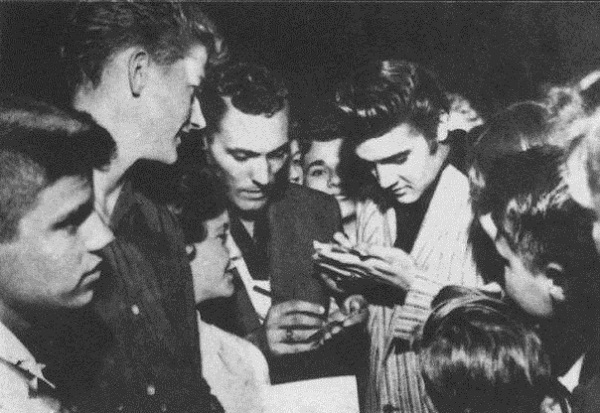 The meeting happened in early winter in of 1956 at Sun Record Studios in Memphis, Tennessee – each there for different reasons, but the resulting recording session came together as though it was destined to happen. Eight Forty-Eight is joined in our Jim and Kay Mabie Performance Studio on Friday by the actors/musicians who bring it all to life at Chicago’s Apollo Theatre, where Million Dollar Quartet is currently running. They are Colte Julian (Jerry Lee Lewis), Shaun Whitley (Carl Perkins), Brandon Bennett (Elvis Presley), Sean Sullivan (Johnny Cash), Brad Ber (Jay Perkins) and Dan Leali (drums).